An early morning suicide bomb attack in Kabul on Monday killed 12 Nepalis. They were working as security guards at Canadian embassy in Kabul. Prime Minister K P Oli has condemned the Taliban terrorist attack in Kabul early on Monday morning that killed 14 security guards, 12 Nepalis and two Indians, and offered condolences to the families of the deceased. A lone suicide bomber walked up to a bus carrying the Nepalis and Afghans who worked at the Canadian Embassy in Kabul, detonating himself. Four other Nepalis and five Afghans were injured. ‘The government strongly condemns the bombing incident and wishes for speedy recovery of the injured,’ PM Oli tweeted. The Taliban took responsibility for the suicide bombing that took place at 5.40 AM, the worst since an attack by Islamists in Iraq in 2004 in which 12 Nepali hostages were shot dead. Widespread communal riots broke out in Kathmandu after international tv channels showed footage of the shootings. The Ministry of Foreign Affairs (MoFA) in Kathmandu said its embassy in Islamabad was trying to ascertain the names of the deceased. Ambassador Tirtha Aryal has left Islamabad for Kabul. The Afghan Ministry of Interior Affairs said in its website that the suicide bomber targeted the minibus that was carrying employees working for a security company guarding the Canadian Embassy. “As a result, 14 foreign (Nepali citizens) were killed and nine others were wounded including five Nepalis and four Afghans,” the ministry said. 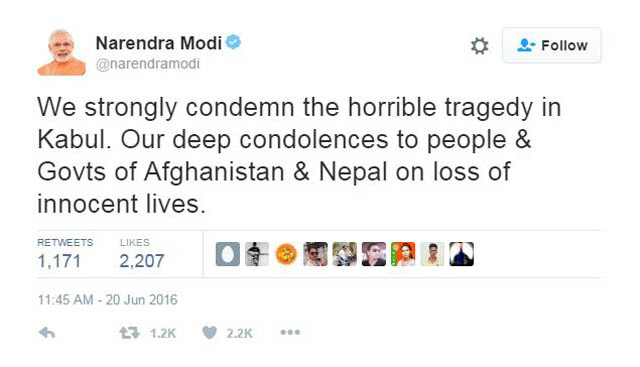 It condemned the incident and offered families and relatives of the deceased Nepalis its deepest condolences. According to Department of Foreign Employment (DoFE) in Kathmandu, a total of 8,644 Nepalis have work permit for jobs in Afghanistan, mainly as security guards. But there is no exact estimate of the real number at any given time. In politics there is no value of human lives, whether thousands of innocent Nepalis killed during the Maoist insurgent, Afghanistan, Kargil war or in the two bloody great wars etc.